A touch screen is an electronic visual display that can detect the presence and location of a touch within the display area. The term generally refers to touching the display of the device with a finger or hand. Touchscreens can also sense other passive objects, such as a stylus. Touchscreens are common in devices such as game consoles, all-in-one computers, tablet computers, and smartphones . The touchscreen has two main attributes. First, it enables one to interact directly with what is displayed, rather than indirectly with a pointer controlled by a mouse or touchpad. Secondly, it lets one do so without requiring any intermediate device that would need to be held in the hand (other than a stylus, which is optional for most modern touchscreens). Such displays can be attached to computers, or to networks as terminals. They also play a prominent role in the design of digital appliances such as the personal digital assistant (PDA), satellite navigation devices, mobile phones, and video games. The first touch screen was a capacitive touch screen developed by E.A. Johnson at the Royal Radar Establishment, Malvern, UK. The inventor briefly described his work in a short article published in 1965 and then more fully - along with photographs and diagrams - in an article published in 1967. A description of the applicability of the touch technology for air traffic control was described in an article published in 1968. Touch screens are popular in the hospitality field, and in heavy industry, as well as kiosks such as museum displays or room automation, where keyboard and mouse systems do not allow a suitably intuitive, rapid, or accurate interaction by the user with the display's content. 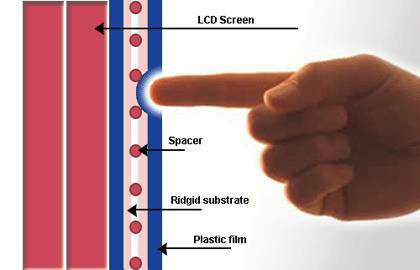 A capacitive touch screen panel consists of an insulator such as glass, coated with a transparent conductor such as indium tin oxide (ITO). As the human body is also an electrical conductor, touching the surface of the screen results in a distortion of the screen's electrostatic field, measurable as a change in capacitance. Different technologies may be used to determine the location of the touch. The location is then sent to the controller for processing. Unlike a resistive touch screen, one cannot use a capacitive touch screen through most types of electrically insulating material, such as gloves; one requires a special capacitive stylus, or a special-application glove with an embroidered patch of conductive thread passing through it and contacting the user's fingertip. This disadvantage especially affects usability in consumer electronics, such as touch tablet PCs and capacitive smart phones in cold weather. Touch screens have subsequently become familiar in everyday life. Companies use touch screens for kiosk systems in retail and tourist settings, point of sale systems, ATMs, and PDAs, where a stylus is sometimes used to manipulate the GUI and to enter data. The popularity of smart phone’s , tablet computers, portable video game consoles and many types of information appliances is driving the demand and acceptance of common touch screens, for portable and functional electronics. With a display of a simple smooth surface, and direct interaction without any hardware (keyboard or mouse) between the user and content, fewer accessories are required. Resistive touch is used in restaurants, factories and hospitals due to its high resistance to liquids and contaminants. A major benefit of resistive touch technology is its low cost. Disadvantages include the need to press down, and a risk of damage by sharp objects. Resistive touch screens also suffer from poorer contrast, due to having additional reflections from the extra layer of material placed over the screen. A Capacitive stylus is a special type of stylus that works on capacitive touch screens primarily designed for fingers, as on iPhone and most Android devices. They are different from standard styli designed for resistive touch screens. According to a report by ABI Research, styli are especially needed in China for handwriting recognition because of the nature of its writing system. Resistive touch screen technology works well with almost any stylus-like object, and can also be operated with gloved fingers and bare fingers alike. In some circumstances, this is more desirable than a capacitive touch screen, which has to be operated with a capacitive pointer, such as a bare finger (gloves will not work on capacitive touch screens). The costs are relatively low when compared with active touchscreen technologies. Resistive touchscreen technology can be made to support multi-touch input. 2. Shneiderman, B. 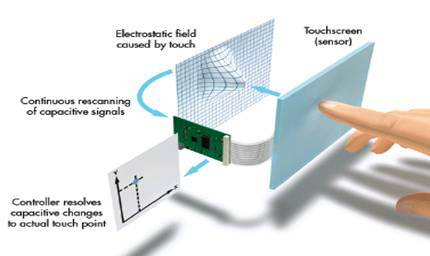 (1991),”Capacitive Vs Resistive touch systems” ,"Touch screens now offer compelling uses" ,Page No’s:74-77.